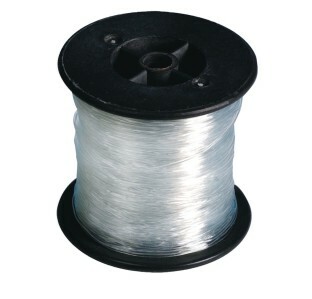 Strong, stretchy jewelry cord perfect for jewelry-making and other crafts. Strong, stretchy jewelry cord perfect for jewelry-making and other crafts. 100-meter (328 feet) spools. 1mm diameter. Many at rehab love to create jewelry. This string serves its purpose but I prefer the .5mm size cord and wish SS would have that option available as well. The 1mm is thicker and harder to tie but you need to know the trick of it if you dont want it to come loose. When ready to tie for the initial knot you line the 2 strings side by side and tie it off like as you would a balloon and pull it TIGHT. Then you tie 2 regular knots to secure it. Hope this helps. This was purchased for a 2nd grade holiday workshop where the kids made bracelets. Beads were great but string was terrible. It would not a hold a knot no matter how we tied them. We ended up h aving to use a string which was not such a good alternative because it did not stretch. Merchant response: Thank you for your review. We have forwarded your comments to Customer Service. This customer has been given a full refund. I love making jewelery with my children but this product makes jewelery making a chore. The cord itself is very flexible but it does not tie together easily making our crafts fall apart when pressure is applied. Merchant response: Thank you for your review. The Customer has been provided a refund on this purchase. We understand a fisherman's knot works best with this Cord. Used for jewerly and sewing projects.